Wish you all a very happy new year 2017. The highlight of 2016 for me was having my parents visit us here in Kansas. They stayed here for 2 months. We had the best time and food. Aayi cooked all my favorites from my childhood. Kids had a fantastic time with grand parents – It was awesome to see the kids running behind aabbu(grand dad) all day long. We took them to all our favorite restaurants. I wish they could stay more but the winter was making me nervous. We were also trying to think about some old/new recipes to post here. This batate kosambari was one such recipe. Aayi has very fond memories of eating it while she was growing up. This is her grandmom’s recipe. 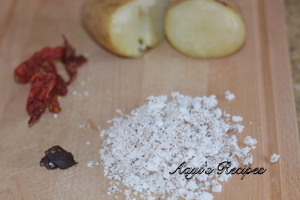 This is a very easy recipe with few ingredients like most of the Konkani recipes. The raw onions give it a nice crunch. We loved eating it with rice and dalithoy while aayi talked about her grandmom. Make the chutney with minimum water needed. Then mix with potatoes and onion. 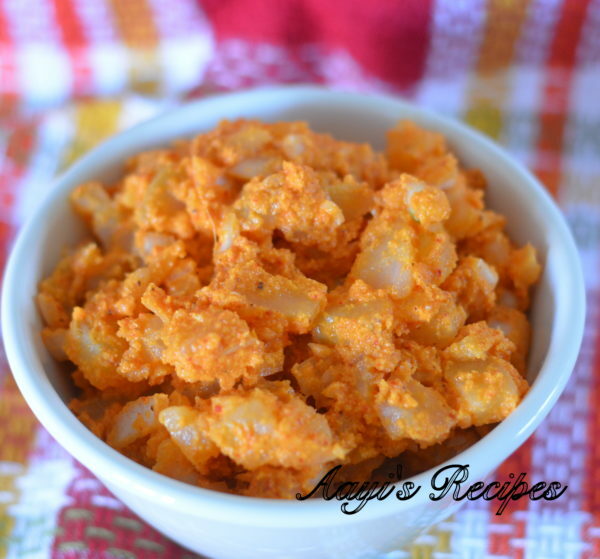 Batate Kosambari is boiled potatoes and raw onions mixed in a spicy coconut chutney. Grind coconut, chillies, tamarind, salt into smooth chutney using very little water. 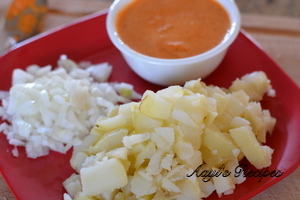 Mix potatoes, onions with chutney. Serve with dalithoy or any simple dal and rice. Shilpa long ago I made this preparation with green onions for my neighbors in Spokane and they LOVED it and now I am delighted to hear that it is a kosumbari ! Mine was purely serendipity! I had masolu but no eggs to make a summer potato salad ? I did have some roasted coriander in masolu! This recipe looks so different.i will sure try this recipe..